Lean knows no bounds. Its teachings and methods are purposely generic and universally applicable. We recently got the opportunity to apply Lean thinking at a place you may not expect – an intermediate school – and achieved heartwarming results. The district was in the midst of a large transition in how it bused its students, which adversely effected a change to the school’s process. Specifically, the process of loading afternoon buses with students was taking far longer than planned, which in turn got kids home later than had been publicized by the school. For busy families, this can throw operational dynamics off dramatically. Schedule-strapped parents had started calling the superintendent’s office to complain, so school administrators knew that they had to take action. They called a meeting with members of the bus company, school system executives, and New England Lean Consulting in an effort to “do something different”. 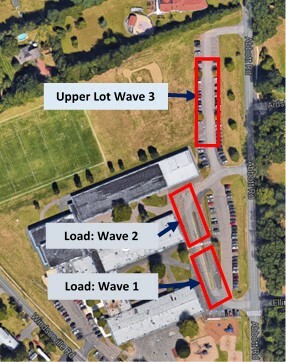 Loading of afternoon buses was being done in 3 “waves” due to space constraints and bus arrival challenges. As buses arrived, their numbers were called in to the office, who kept track of their position in line. Once 10 buses had arrived (Waves 1 and 2) and were parked, students could be dismissed to start loading. For safety reasons, students cannot be loading onto buses while any buses are in motion. 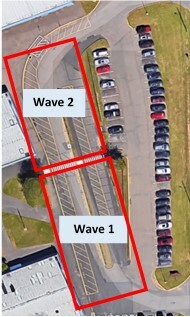 Once waves 1 and 2 were parked, the principal (who was outside managing the process) notified the office, who in turn made the announcement over the school’s intercom system to release the students. During our observation, this was done at 2:58PM; 7 minutes earlier than normal, in an effort to get students home closer to on time. The first wave left the school at 3:10PM. The second wave left at 3:20PM, at which time the third wave proceeded from the upper parking lot to where wave 2 had been. That wave was loaded and left at 3:30PM – 32 minutes after the process had started. It had been a herculean effort on the part of the staff to ensure that all children were present, accounted for and safely on their way home. Together, New England Lean Consulting members and school administration reviewed opportunities for improvement in order to achieve the Future State. In reviewing Current State observations, it became clear that there were two major issues to be addressed: Space and Communication. To address the space concern the team explored many options, which culminated with challenging one of its oldest paradigms; being able to use the existing “Parent Drop-Off’ lane. This lane is used by parents for student drop-off in the mornings, but it had never been used in the afternoon. It had always been understood that this lane needed to be kept clear during the afternoons for safety reasons (students and parents crossing in the crosswalk), but through the team’s investigation, this belief was proven to be false. Immediately, this opened a path to achieving a 2 wave system by opening up additional spaces for buses to load. To address the communication issue, the team implemented quick enhancements that cost less than $100, but made vast improvements to the process. Within each classroom, student bus assignments were added to the existing visual control areas to serve as a quick reference in case students forgot which bus they were supposed to go home on. When buses are “called” for dismissal, it takes no time for students to check the chart to see if they are on one of those buses. To address the issue of 3 school exit points, the team determined that the most affected students are those who exit in the middle of the bus row. In essence, these students had a 50/50 chance of guessing which direction to turn once they arrived at the bus line. Just as in any organization – “guessing” is not an acceptable process to provide to associates, so the team benchmarked the airline industry and incorporated a terminal departure board. As buses arrive, this board is marked with the bus number and physical loading position. As students then exit the building, the board can be quickly referenced to tell students where their respective bus is within the bus lines. 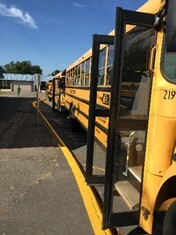 The team also reviewed operator standard work – what are the office administrators to do as buses arrive, how to the kindergarten teachers arrange students and lead them out for dismissal (Note: because of their age, the school takes special steps to ensure that these students are loaded onto buses safely and securely), etc. 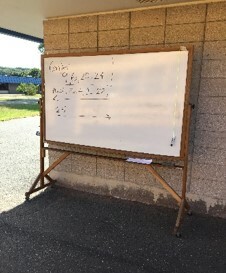 Once the team compiled and compared notes, the principal met with the school’s teachers and administrators to ensure everyone knew what their roles were and what to do if they had any problems during the process. After a few days, the “new process” was implemented and observed. The impact was immediate and obvious. No longer was it a “race” for bus drivers to try and avoid being in Wave 3 (which, in some cases, added 20 minutes to their routes). Consistently, buses are now knowingly in Wave 1 or 2. 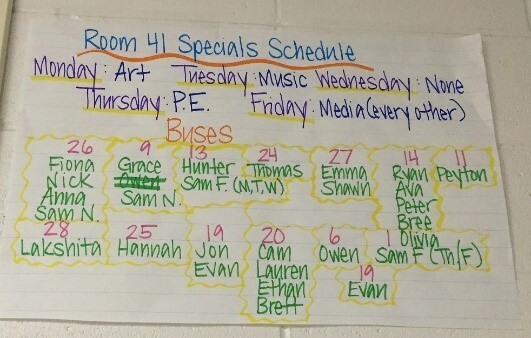 Likewise, students don’t have to keep track of 3 bus dismissal announcements. The departure board makes for easy reference as to bus location, and many students refer to it – even those from the end-of-building exits. On the day we observed the process, we did encounter an abnormal condition – one of the buses would not restart. The principal jumped into action: A replacement bus was called in, students removed from the bus and given snacks while they waited, and the buses behind the broken bus were rerouted. All in all, it took an extra 3 minutes and 10 seconds to address and rectify the problem, which lead us to miss our takt time of 20 minutes. It is worthy of note that since then, the loading process consistently meets or beats their 20 minute goal; a 40% reduction in bus loading time. New England Lean Consulting is proud to have been asked to take part in this event, as we believe Lean thinking can be applied anywhere, to any process. We believe that the two pillars of Lean are Continuous Improvement and Respect for People, which this event addressed in spades. During our Current State observation, it was clear how painful the process was. 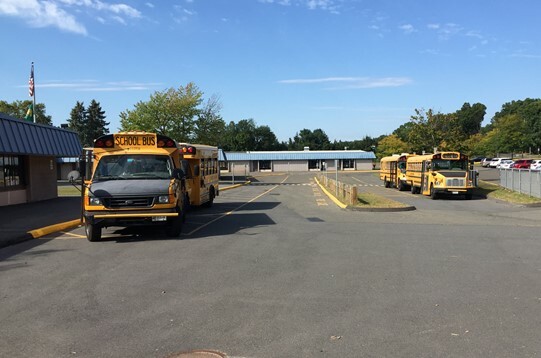 The principal, acting as a direct supervisor to the process, was barely able to keep up with all of the things that required manual intervention – bus arrival and positioning, administration direction and understanding, and student questions. It was several hours’ worth of emotional energy spent in 32 minutes, and he was physically exhausted after the effort. After the improvements had been implemented and we observed the Future State, the change was remarkable. We watched as the principal and school administration effortlessly performed their tasks of updating the departure board and guiding students to their buses. It was a smooth as one could expect 800 students getting onto 17 buses within 20 minutes could be. The best part of the entire event was the contrast of the principal. Before, he’d been consumed by managing the process. After, he was able to high-five and hug his way through the student body, wishing them all a great weekend and reminding them to hug their parents when they got home. And that’s why we do what we do here at NELC.